Valuation Guide by Ken Arnold. 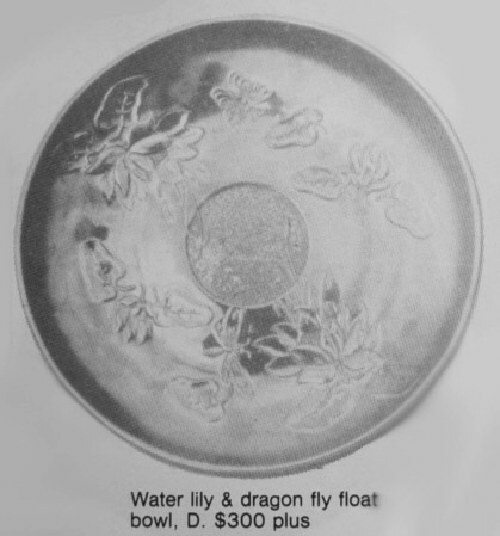 Dark WATERLILY & DRAGONFLY Float Bowl. 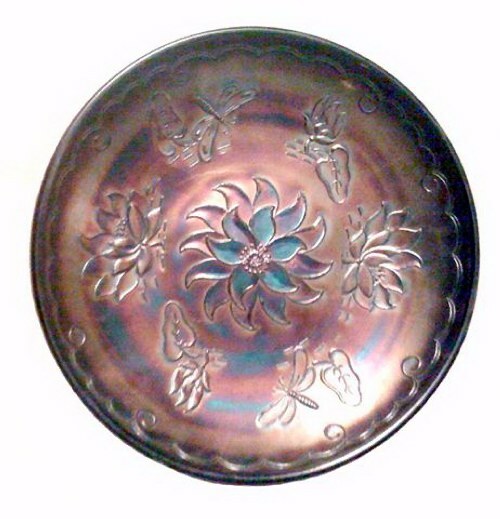 WATER LILY & DRAGONFLY: This lovely 11” float bowl would enhance any collection, whether marigold or black amethyst. According to Ken Arnold’s Book, black amethyst is known by (delustre-dark/black). 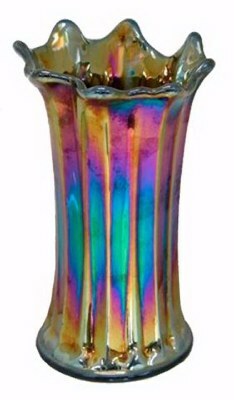 The majority of Australian made carnival glass was produced between 1924-1930. 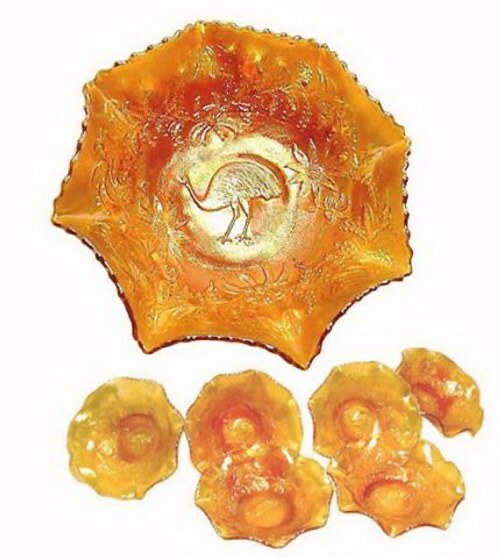 EMU 9 inch Bowl in Marigold. Master EMU Bowl is 9.5 in. wide x 3.5 in. high. The EMU Nappies - 5.5 in. wide x 1.75 in. high. 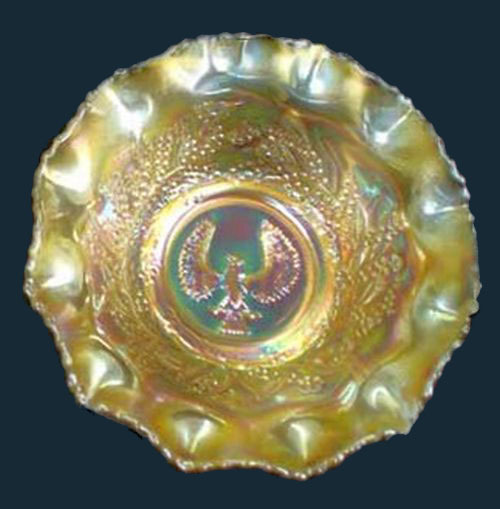 EMU: The design was used on compotes and a salver, as well as the bowls shown here. The small Emu bowl has slight pattern variations to the larger bowl. The five-inch bowls have no reverse pattern. Application was made for this pattern on November 4, 1924, and was registered as No. 40360. Emu is a flightless native bird. It is featured on the Australian Coat of Arms. 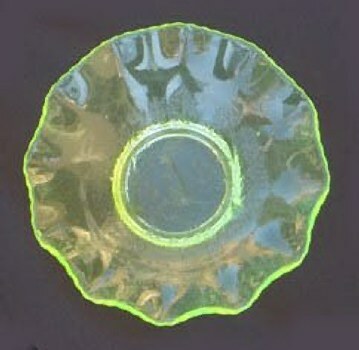 The marigold bowl is sometimes found on aqua-based glass. Roselin Pink and Citron 5 inch Nappies. 2-5inch NAPPIES: In browsing through the Ken Arnold Book, we believe these nappies must be the ones shown on page 30, called Crimped Nappy No. 231. 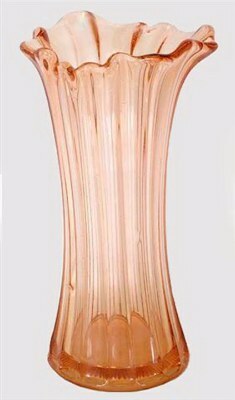 Middle: LILY Funeral Vase - Roselin Pink -10.5 in. high - not iridized. Right: LILY Funeral Vase - Marigold - 9.5 in. high - 4.75 in. base. 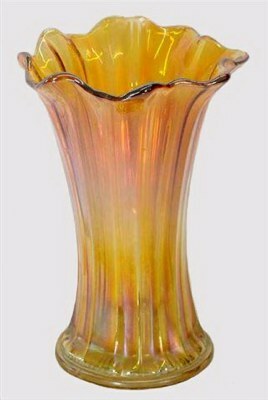 LILY Vase: These 10”-12” vases are shown in the 1929 Crown Crystal Glass Co. Catalogue and listed as No. 295. PG. 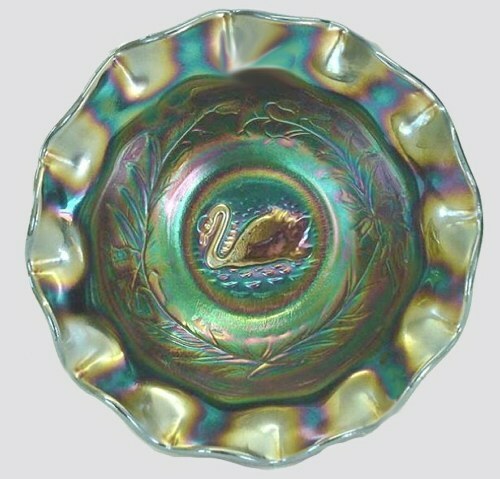 89 - Carnival Glass of Australia. The 5 line design is common on Crown Crystal Glass. 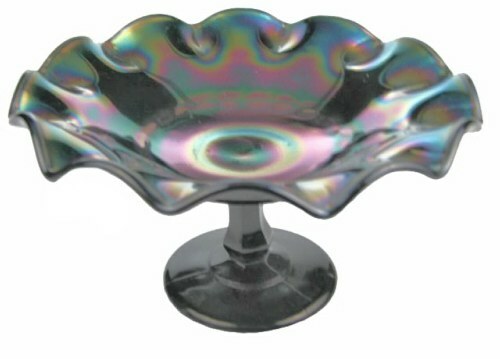 Black Amethyst PLAIN COMPORT - 5 lines go around the exterior of bowl. PLAIN Comport: Plain interior with the 5 line exterior design. This line design is frequently found on Australian made glass. 5 inch SHRIKE in Marigold - No reverse pattern. SHRIKE - 5” Bowl: Design is the same as found on the 9” size Shrike bowl. There is no exterior pattern. Black Amethyst 9 inch SWAN - R 4697 not visible under watermarks. 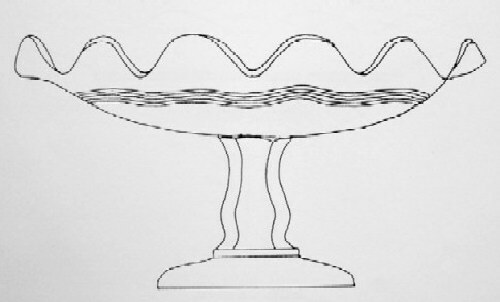 SWAN – 9” Bowl: This design was registered more than a year after the Kookaburra design in January 1924. The Black Swan is a feature of the Western Australian Flag, and has been in use since the late 1860s. Four sprigs of Christmas Bells are seen encircling the swan design. 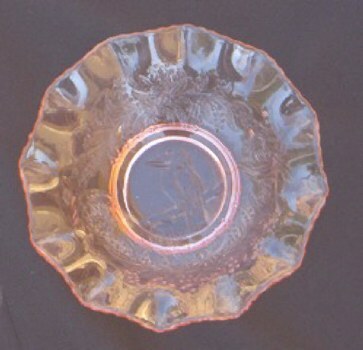 Sometimes the bowl edge is rounded; others are ruffled. 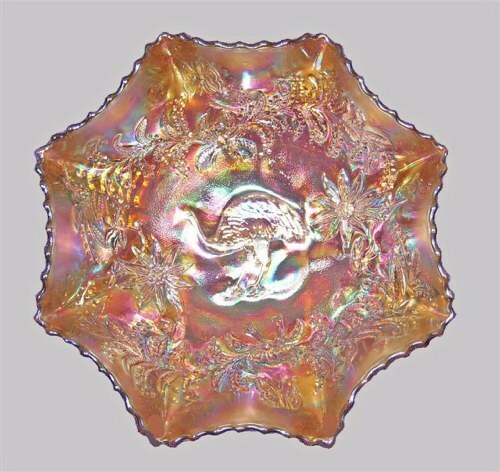 9” bowls can be found having the Fern and Wattle exterior design. Variations of the Fern and Wattle: Use of either 5 or 6 frond and leaf in the pattern.